Rane releases new SL 3 interface for Serato Scratch Live | What Hi-Fi? So it is that some of the biggest-name disc-spinners in the world, including Paul Oakenfold, Fatboy Slim and Afrika Bambaataa, have taken to using Rane's Serato Scratch Live. This nifty piece of hardware allows you to play, mix and manipulate digital music files as if they were vinyl using your existing turntables. 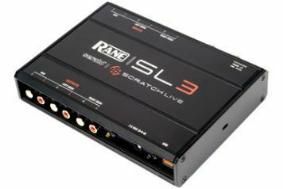 Rane has now released the SL 3 audio interface, an upgraded and hopefully improved version of the all-important control box. “Our professional customers want a bigger sound from a smaller box with simpler connections, so that's exactly what we've madel,” said Steve Macatee from Rane Corporation. "The SL 3 is about minimizing noise and maximizing audio performance." The Rane SL 3 has a 24-bit USB 2.0 audio interface, a 104 dB dynamic range, and can still be used to mix merrily between vinyl and CDs. This new box is also armed with an extra set of auxiliary channels. The Rane Serato Scratch Live SL, complete with the new SL 3 audio interface, is on sale now for £599. For more information, head over to the Rane website.